A couple of months ago I got a Cousin, and since she would be baptised soon, we needed a present. Well, usually for baptism you get expensive necklaces, but the Baby can´t use it yet it´s expensive and everyone get´s that. 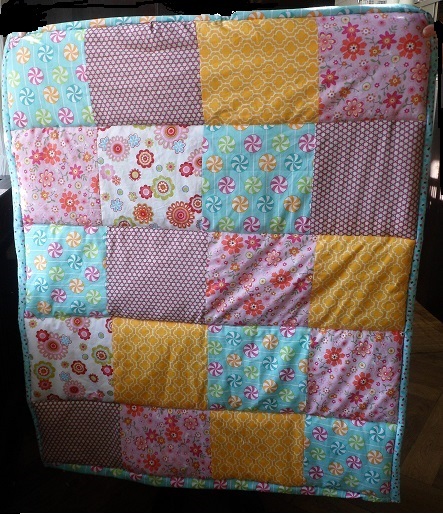 I thought giving her one of those was expensive and boring, and since I wanted to give her something that comes from heart, I thought, why not make her something… So I brainstormed, and I came up with a Patchwork blanket, ´cause a frind of ours makes them and I admire them. Well, she told me how to make one and I got straight to work, together with my mom we looked for nice fabrics that would fit for a baby. When we were finished, we didn´t wanna give it away, we were so proud of ourselves and my aunt loved the present! !